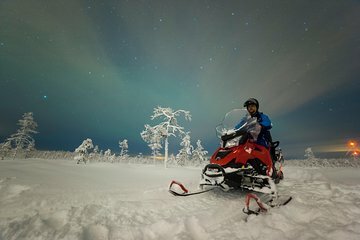 Set off into the snowy Finnish wilderness on this evening snowmobile safari from Rovaniemi. Zoom through the forest in search of the Northern Lights, then stop at a picnic spot to have a bonfire and set up a tripod for the best possible night sky photos. Use of thermal clothing during the safari, including thermal overall, boots, gloves, woolen socks, a scarf, and helmets, is included.